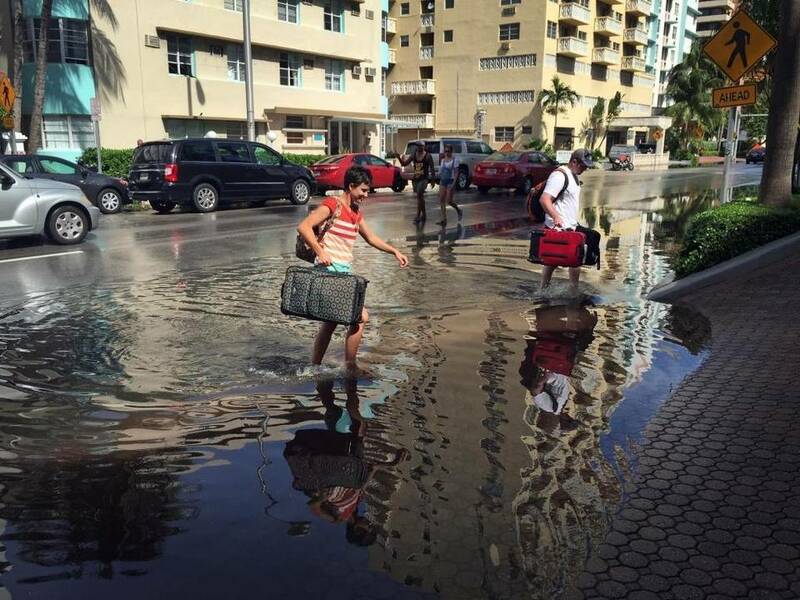 According to a 2015 report by the Miami Herald, southeast Florida is the region in the world at greatest risk from rising ocean levels. If sea levels rise by six feet by 2100, which many scientists expect because of the accelerating rate of polar ice melt, 6 million people in Florida will live in flooded areas. The Herald says that, according to the Risky Business Project led by former New York City Mayor Michael Bloomberg and U.S. Treasury Secretary Henry Paulson, “the value of Florida property at risk from climate change (is) first in the nation. By 2030, they estimated $69 billion at risk, with sea rise alone expected to threaten $15 billion in property. Tropical storms are the norm in Florida, but as the ocean warms, we can expect more and more devastating hurricanes like Matthew. Recent research has shown that we are experiencing more storms with higher wind speeds, and these storms will be more destructive, last longer and make landfall more frequently than in the past. Rising temperatures are leading to increased demand for water and energy. This will constrain development, stress natural resources, and increase competition for water among communities, agriculture, energy production, and ecological needs. Changes to crop growth cycles due to warming winters and alterations in the timing and magnitude of rainfall events have already been observed; as these trends continue, they will require new agriculture and livestock management practices. Landscape fragmentation is increasing. A highly fragmented landscape will hinder adaptation of species when climate change alters habitat composition and timing of plant development cycles. Communities that are already the most vulnerable to weather and climate extremes will be stressed even further by more frequent extreme events occurring within an already highly variable climate system. The magnitude of expected changes will exceed those experienced in the last century. Existing adaptation and planning efforts are inadequate to respond to these projected impacts. We are all connected. Florida’s global warming problem is Montana’s problem. While Montana will not experience the magnitude of impacts of global warming that Florida will, swift action is required to reduce carbon emissions. This means a rapid transition from traditional fossil fuels to clean energy, supported by government incentives, a carbon tax, and other measures. As Florida is devastated by a storm fueled by warmer oceans, we can no longer afford ourselves the luxury of complaining about “a war on coal” or allow our government agencies to permit oil and gas companies to operate with minimal regulation. We can respond quickly if we act together to move toward a carbon-free future rather than clinging to our devastating energy past. This entry was posted in Climate change and tagged Florida, global warming, Hurricane Matthew. Bookmark the permalink. or is it Hear hear?